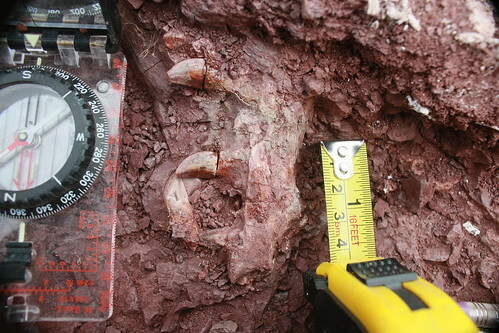 The Houston Museum of Natural Science Paleontology team has discovered an articulated specimen of a Dimetrodon on the Craddock Ranch in Baylor County! 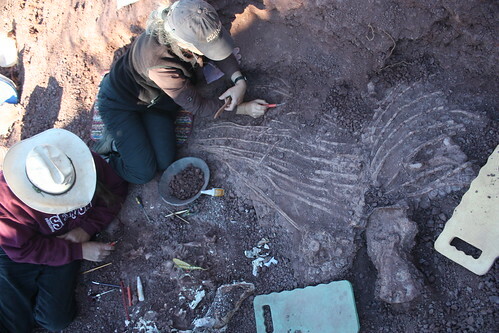 The team named the fossil “Wet Willi”—“Wet” because it was found while excavating a drainage trench for the quarry, and “Willi” for Samuel Williston, a paleontologist and educator who was active at the site one hundred years ago. Dimetrodon bones are common in the Craddock quarry, but articulated fossil skeletons, like “Wet Willi,” are extremely rare. Most of the Dimetrodon fossils on display in museums across the country, and even globally, have come from this area of north central Texas. Can’t see the video? Click here to view it on Vimeo. “Willi” represents a subspecies, Dimetrodon giganhomogenes, originally described by Paleontologist E.C. Case in 1907. The type of specimen he used for his description had no head; “Willi” is the first example of this species found with the head attached. Get a load of those TEETH. See the full set of photos from the site on Flickr. In life, “Willi” was the dominant predator of his world, and he would have been 11 feet long with a four-foot vertical fin running the length of his body. The purpose of the prominent fin that defines this species has been debated since it was first discovered by Edward Cope in Texas in 1878. It was originally suggested that the fin was used for thermoregulation—self-regulation of body temperature, even when outside temperatures may vary drastically. However, it now seems more likely that this dramatic fin was for show—to intimidate enemies and fascinate potential mates. “Wet Willi” will be the star of the Permian section of the Museum’s newly renovated paleontology hall, opening in 2012, and will serve as an ambassador from this geologic period for millions of patrons. The Permian ended with the worst mass extinction known, and was a direct precursor to the rise of dinosaurs. At present, the Museum has a mural of the Permian Period featuring a Dimetrodon, but no fossils on display. well you done gone and done it again. she’s a beauty! The name is perfect too, honoring those paleontologists – and southern rock bands – that came before, as well as the time honored childish tradition of the finger in the ear, all in one fell swoop! With teeth like that, she’s bound to “keep on smilin”! Nice critter. I am so impressed. Hey, send me an email. I still have a few of your specimens as hostages. Go Dave & Dr. B.! Congrats on the discovery! Hope the excavation is going well! What a beautifully preserved specimen, which I presume is another example of the wonderful, diverse vertebrate fauna of the “Texas Red Beds”. I have to say that for the past few of hours i have been hooked by the amazing articles on this site. Keep up the wonderful work.